Want to quickly see how the open-source software BLOG:CMS works? You'll find a free and updated demo installation of BLOG:CMS here. We are currently updating the BLOG:CMS demo. Please check back shortly. There will be a new version up soon. 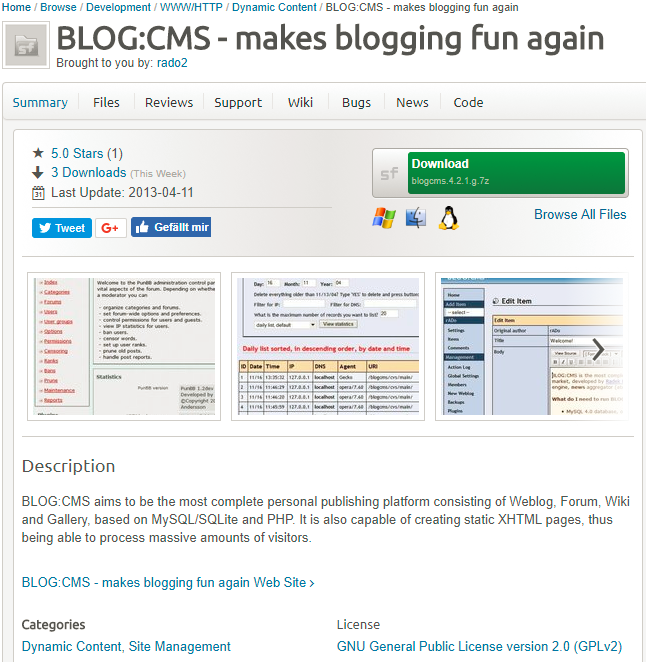 Blog:CMS is a free open source personal content management system developed by Radek Hulan in PHP, that uses a MySQl database. It was designed to be a personal publishing platform that brings a lot of cool features like a weblog, integrated forum, wiki engine, photo gallery and news aggregator. If you want to see how a Blog:CMS demo looks like you can download it from SourceForge and go through the installation process. The latest version available for download is 4.2.1.g and was released on June 6, 2011. The software has support for the following languages: English, German, Czech and Russian.